Students in fourth and eighth grades in Defense Department schools turned in strong performances on a 2017 national assessment, scoring at or near the top of the charts of participating states in reading and mathematics. All the Department of Defense Education Activity students’ scores ranked in the top three states or jurisdictions in the nation in the National Assessment of Educational Progress, the only nationally representative and continuing assessment of what students know and can do in various subject areas. The scores range from 0 to 500; in early 2017, students were tested in math and reading. DoDEA’s eighth-grade students scored highest in the nation in reading. The DoDEA average score was 280, up three points from their score in 2015 (the last time DODEA eighth-graders took the test) and 15 points higher than the national average score of 265 for public school students. Eighth-grade students tied for third in the nation in mathematics. The average score was 293, up two points from 2015 and 11 points higher than the national average of 282 for public school students. Fourth-grade students tied with their counterparts in Massachusetts for first place in the nation in mathematics. The average score was 249, up one point from the last time students took the test, in 2015; it was 10 points higher than the national average score of 239 for public school students. Fourth-grade students were second in the nation in reading. The average score was 234, the same as 2015. That’s 13 points higher than the national average score of 221 for public school students. NAEP results also are reported in terms of three achievement levels: basic, proficient and advanced. In 2017, NAEP conducted testing in math and reading. In 2017, 51 percent of DoDEA fourth-graders scored at or above the proficient level in math, compared with 40 percent nationwide. In reading, 48 percent scored at or above the proficient level, compared with 35 percent nationwide. As for eighth-graders, 42 percent scored at or above the proficient level in math, compared to 33 percent nationwide. In reading, 51 percent of students scored at or above the proficient level, compared to 35 percent nationwide. 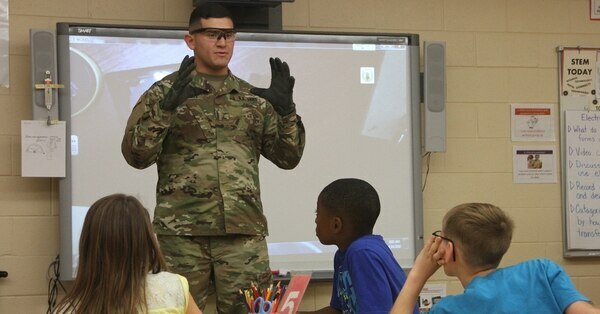 The Trump administration is considering a plan to end the military’s longtime operation of schools for military children on dozens of stateside military bases. Not all students take the NAEP; in most cases, it’s a representative sample of students. However, in DoDEA schools, all the students in the designated grades take the test that particular year. At the time the tests were taken in early 2017, there were approximately 6,248 fourth-graders and 4,522 eighth-graders eligible to take the test, according to DoDEA officials. Information is not available on whether there are differences between NAEP scores of students in DoD overseas schools and students in stateside schools. DoDEA operates 166 schools in 11 foreign countries and seven states as well as in Guam and Puerto Rico. NAEP officials report only state or jurisdiction (i.e., District of Columbia or DoDEA) totals. “Our students’ strong performance was especially significant in light of the fact that this was the first year of digitally-based administration of the NAEP assessments in our schools,” Brady said. Before 2017, the students took a paper-and-pencil test. In 2017, all students could use a computer tablet. “We’re also proud of the fact that our achievement gaps continue to narrow in comparison with the national average, and we are looking for ways to decrease those gaps even further,” he said. For example, DoDEA African-American students in the fourth grade scored an average of 239 in mathematics in 2017, up three points from 2015. The national average of African-American students in 2017 was 223, down one point. In eighth-grade mathematics, DoDEA African-American students’ average score rose six points, to 277, while the national average remained the same at 260.